Hi guys! It was my niece’s birthday today. 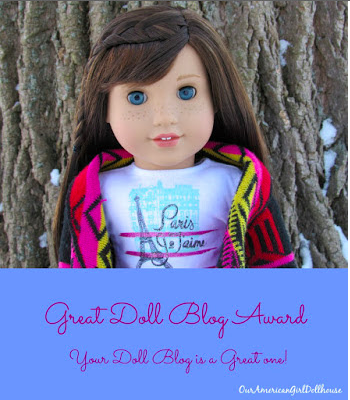 Along with tons of gifts for her dolls to play with, we also made her a fairy garden kit. 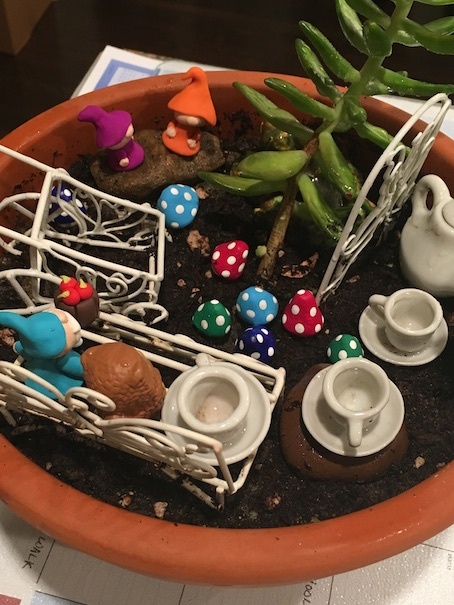 The fairy garden kit contains everything needed to build your own fairy garden. 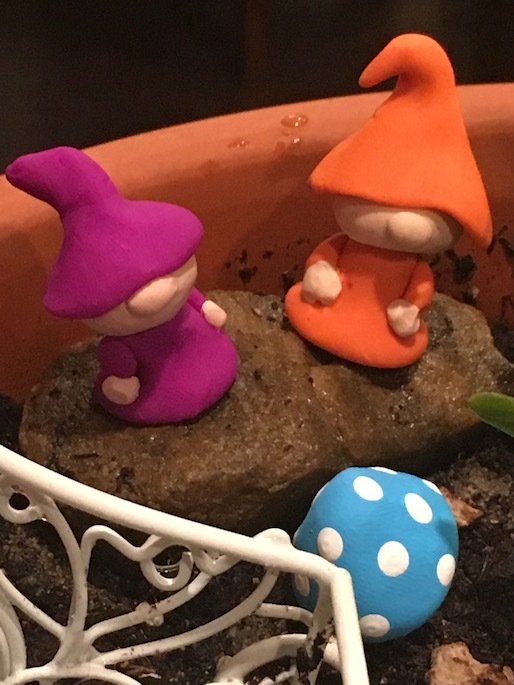 My mom pitched in for some fairy patio furniture, a mini wheelbarrow, and some other miniature accessories as well as a pot, while I made the little polymer clay gnomes and the mushroom pieces. I also brought some plants for her to put in her fairy’s garden. 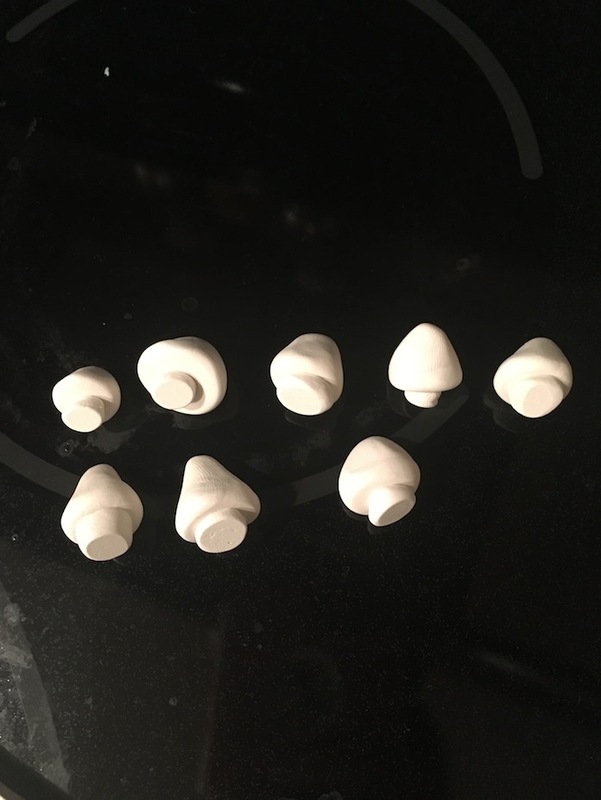 I varnished all of the pieces to seal in the paint. 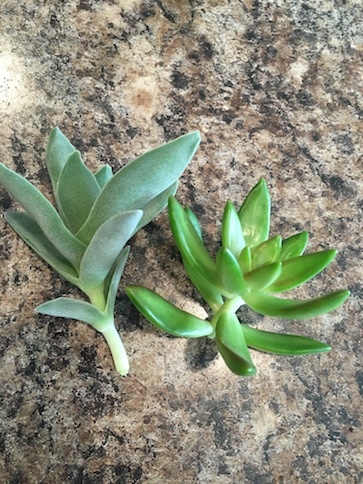 Next, I took some cuttings from some of my own plants. 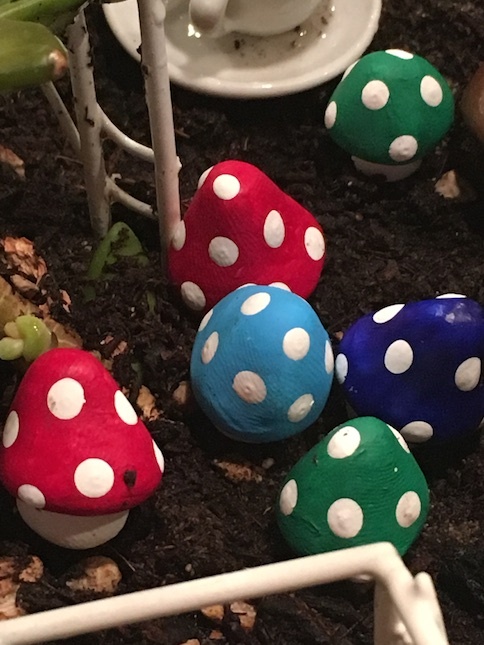 These types of succulents are great for fairy gardens. 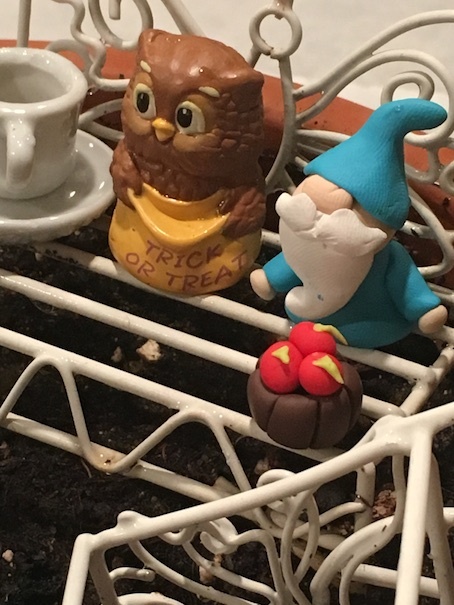 You just plant them, and they take root quite quickly. 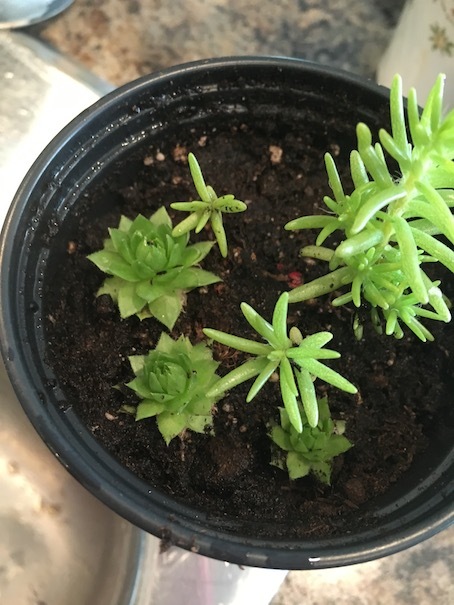 I also gave her a few of my Portulaca sprouts, and some buds from my hen and chicks. These make wonderful foliage for fairy gardens. 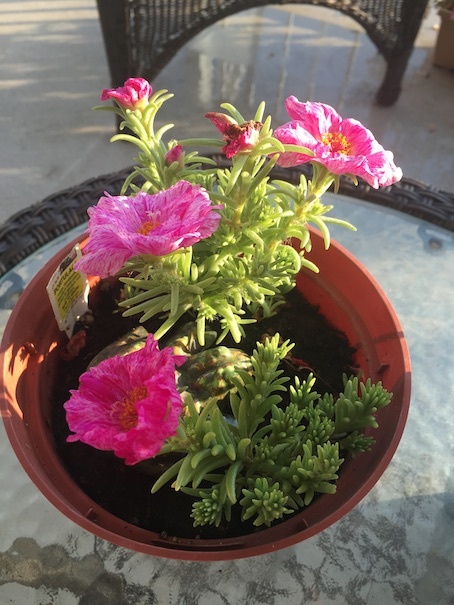 This is my Portulaca plant in full bloom. 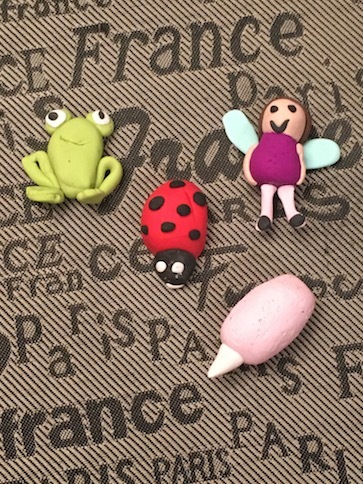 I think it will be very cute for the fairy’s garden. This is one of my own plant pots. My niece will be building hers in a different pot. 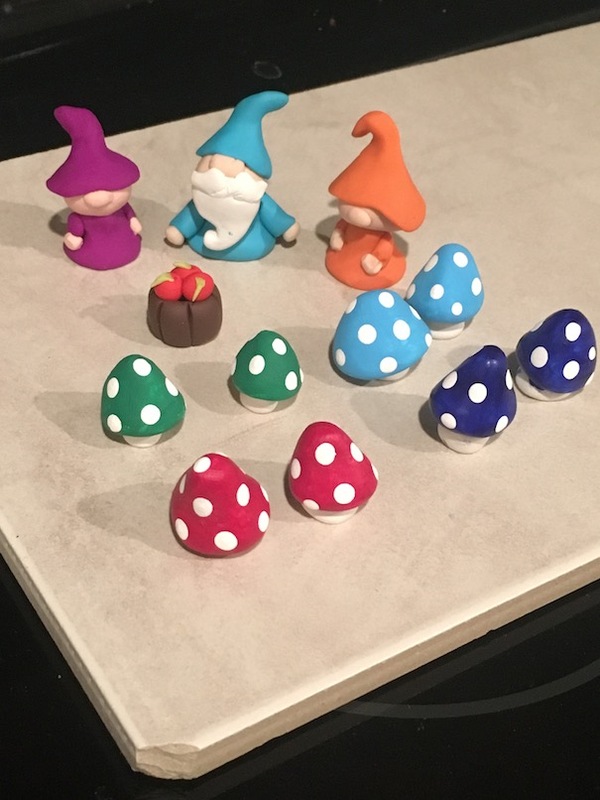 I just added the little gnomes and the mushrooms in there to see how they look. 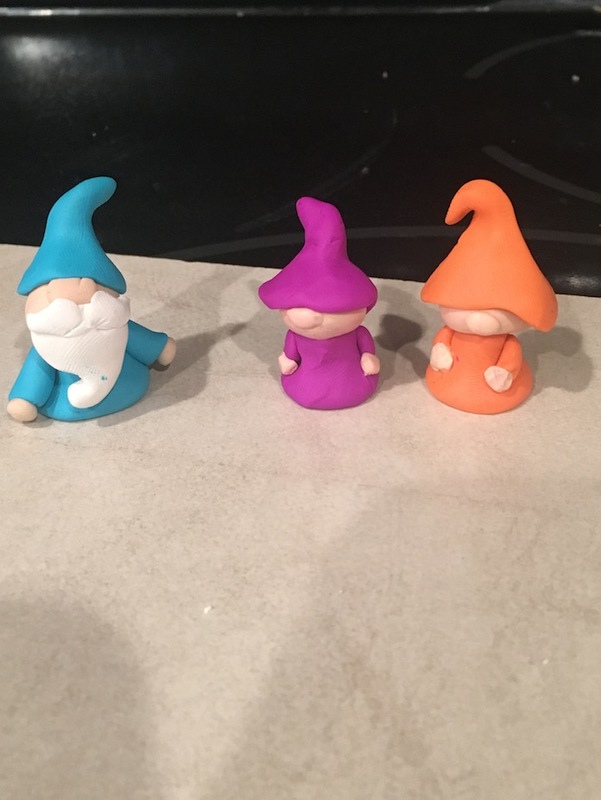 Little Miss has dubbed the blue gnome, the daddy. 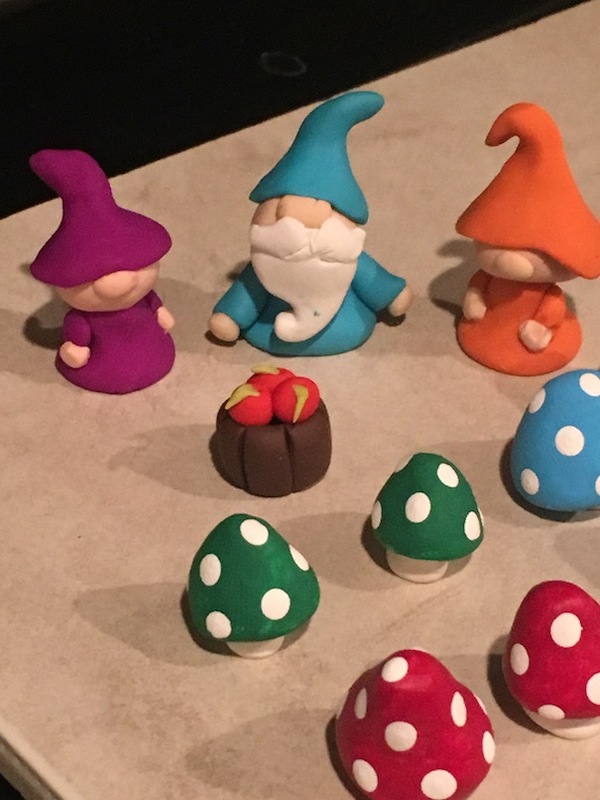 There are tons of things that you can make for a fairy garden out of polymer clay. 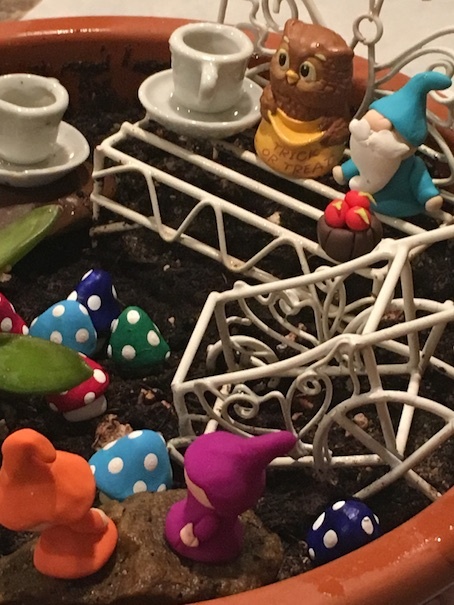 Anything goes in a fairy garden. Even miniature tea cups. I can’t get over how cute it is! I can’t wait to see when she sets it all up! 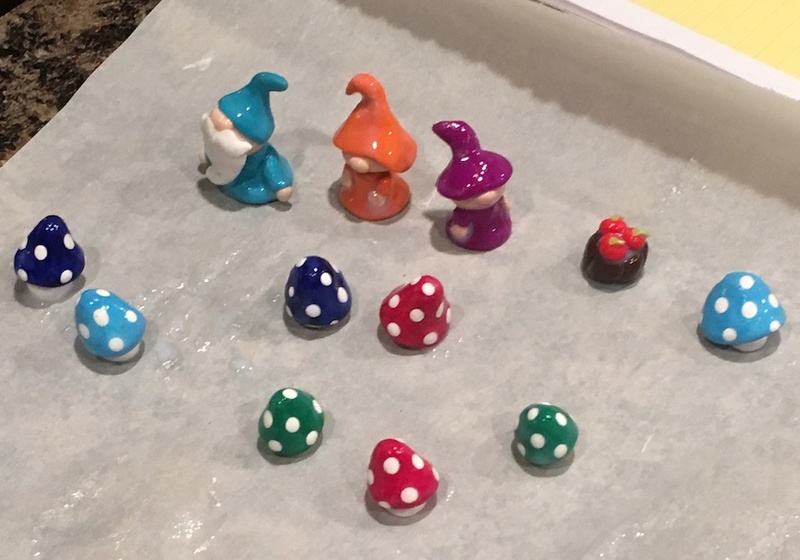 Afterward, we took out the little gnomes, and all the little mushrooms, and brushed them all off. 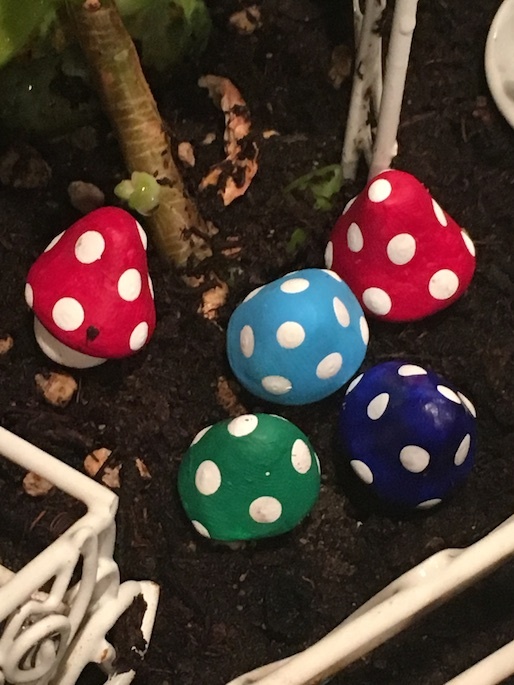 Then we put them, along with all of the little plants into a package for my niece. 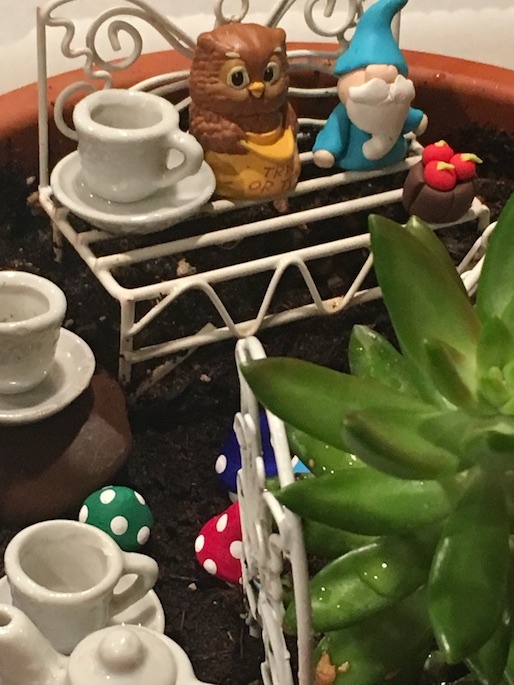 My mom added the pot, some polished stones, and the fairy furnitures. 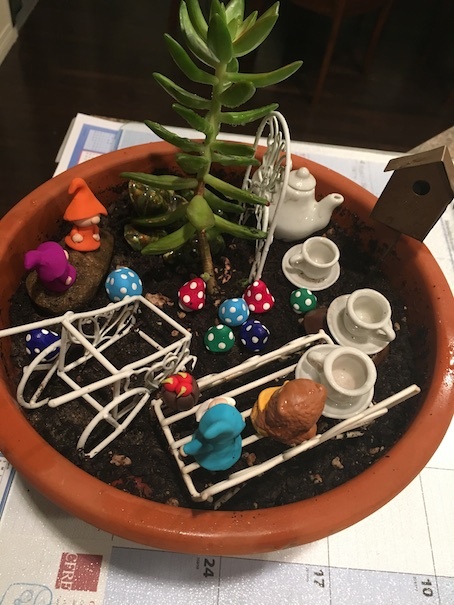 The birthday girl absolutely loved her fairy garden kit! 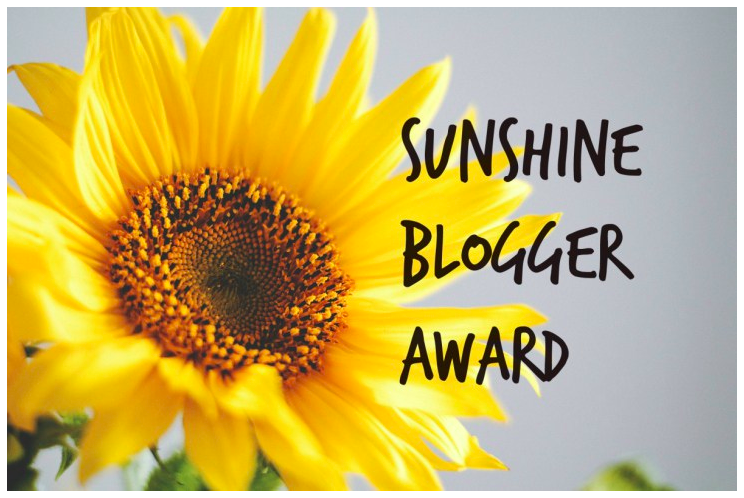 🙂 We had so much fun making it too! 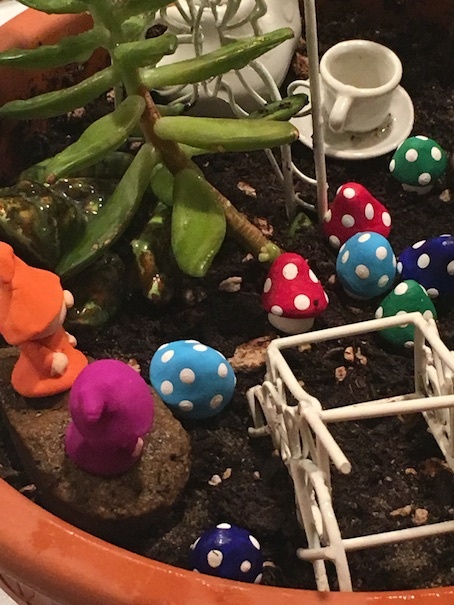 Cotton candy is definitely a must for any fairy garden. ❤ lol! 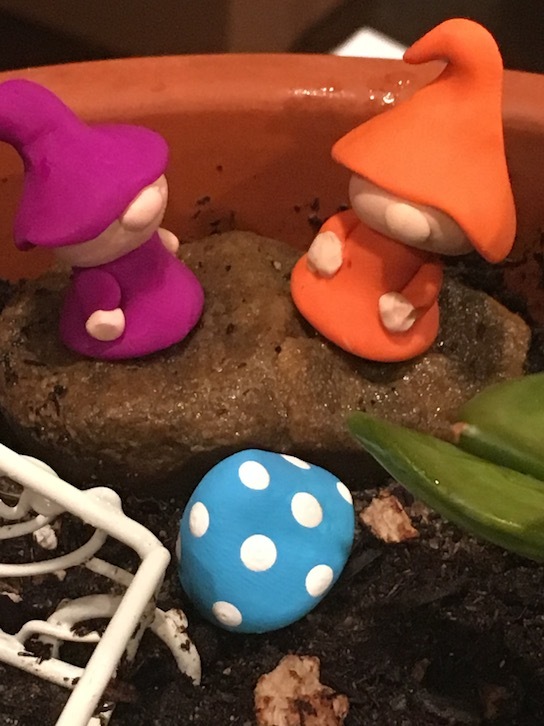 Do you have a fairy garden? It could be anywhere. It doesn’t have to be in a pot. Even a tiny corner of dirt somewhere with a few little plants growing in it is ideal for fairies. 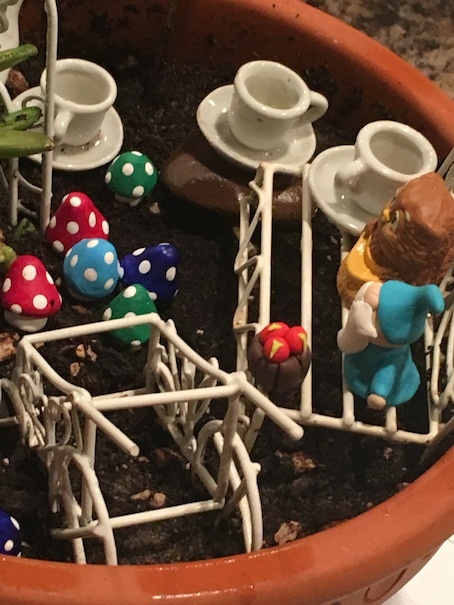 Usually every Spring, my granddaughter and I each build our own fairy garden. It is so much fun. I know Little Miss and her cousin will have a great time as they create their individual gardens!